Stories about cellphone distractions are rarely out of the news these days. A new law in Illinois went into effect on January 1, prohibiting drivers from using cellphones that are not hands-free and California tightened its rules by making it illegal for drivers under 18 to use voice-activated texting, handheld, or hands-free calling. Many police departments, like the one in Lubbock, Tex., have announced new enforcement programs for 2014 aimed at distracted drivers. The related problem of distracted walking also has its moments, such as the late-December story about an Australian woman who walked off a pier because she was more intent on checking out Facebook than watching where she was going. That incident joins the pantheon of examples of distracted walking, including the viral video of a young woman plunging into a mall fountain because she was engrossed in her small screen. 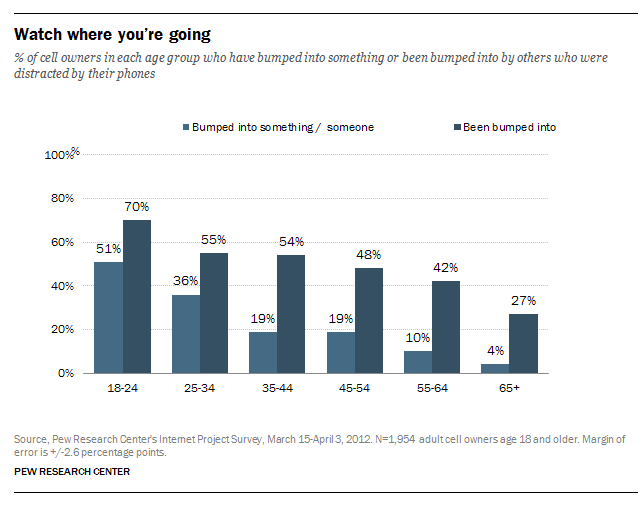 A Pew Research Center survey in mid-2012 found that 23% of cell owners have physically bumped into another person or object because they were distracted by using their phone, a statistically significant increase from the 17% of cell owners who said that this had happened to them the first time we asked this question in May 2010. In addition, 50% of cell owners say that they have been bumped into by another person because that person was distracted by using their own cellphone. Taken together, that works out to 53% of all adult cell owners who have been on either the giving or receiving end of a “distracted walking” encounter. Young adults (in particular those ages 18-24) are especially prone to experience these “distracted walking” encounters. Half of these young cell owners (51%) have bumped into a person or object because they were busy paying attention to their phone, and 70% have been bumped into by another person who was distracted by using their own cellphone. Outside of age, there are very few demographic differences around distracted walking experiences. And although urban residents might be expected to find more opportunities for these unexpected encounters, there are no differences on this question pertaining to urbanity. Cell owners living in urban, suburban, and rural areas are all equally likely to have bumped into someone or something (or to have had someone bump into them) due to cellphone distraction. In addition to age, the type of phone people own—and how they use that device—is fairly strongly correlated with this behavior. Some 32% of smartphone owners have run into someone or something because they were distracted by using their phone, compared with 14% of non-smartphone owners. Those who use their phones fairly intensively are also prone to these collisions. For example, some 37% of cell owners who go online mostly using their cellphone have bumped into someone or something because they were using their phone, as have 37% of those who go online using their phone on a typical day.